I hope you’ve all had a wonderful weekend. We spent a lot of time at home relaxing, cooking (my husband), and I admit a bit of book shopping. I’ll save the discussion on some of my book buys for another day because I ordered some books so I’ll wait until all arrive so I can do a show and tell. As we don’t have any other family in town, other than my mom who lives with us, we didn’t make the traditional Thanksgiving dinner but my husband outdid himself with a cake! One of my favorite cakes to enjoy in Germany when we visit is a Bienenstich cake. The “bee sting” cake is topped with honeyed almonds and if you have this while sitting outside in a cafe you are sure to attract bees! 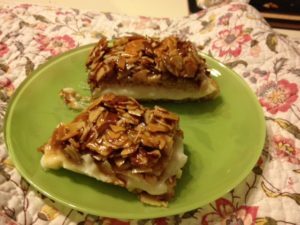 This was the first recipe my husband tried out from Classic German Baking and I know it won’t be the last. The cake tasted delicious although we had a lot more almonds on it than what we normally have and the cake part didn’t rise as much. So some tweaks are probably in store but still very delicious. I enjoyed eating my piece while watching Department Q. This trilogy is based on Jussi Adler-Olsen’s books featuring Detective Morck set in Denmark. I loved the first book The Keeper of Lost Causes and have to say this first episode is very much like the book. My idea of Morck and his assistant Assad though are not like I pictured them but that didn’t detract too much from the show. Actually we enjoyed the first so much that we are planning to watch the second episode tonight. I also read the sequel, The Absent One, and liked it but I remember thinking it was very intense. I am so curious how this will play out in the show. But if we are going to watch all three episodes you know what that means. I’ve got to read the third book! I’ve fallen behind on this series and I think there are now six books. So even though I have some other books going on (even mysteries) I ended up selecting A Conspiracy Of Faith for my weekend reading. I have more to tell you about, I even discovered a fabulous indie bookstore which deserves its own post, but now it’s getting late and we have to watch our show. Is it bad to want another day off? I never seem to catch up on my reading. Anyway, what about you, did you get to do a lot of reading this weekend? I did a bit of book shopping this weekend too, although from my computer. I finally settled on books to get everyone for Christmas. Hopefully everyone will enjoy them. It sounds like you had a nice Thanksgiving. 🙂 I haven’t seen Department Q or read the books. Maybe one of these days. Have a great week, Iliana! I love Adler’s Department Q series–one of my very favorites! I’m a little nervous about seeing the actors who play Morck and Assad, but would still like to see how the actors handle the roles! I bought a few books online. The sales were not as good as previous years, though. Sounds like a very nice weekend… and I might have purchased a book or two online, too! That cake looks beautiful! Glad you had what sounds like a re ally lovely Thanksgiving! Sounds like a wonderful weekend and that cake sure looks delicious!